It wasn't bad per se, but there was nothing that captured me. I feel like I missed something. The synopsis characterizes Sebastian as a demon to whom Ciel sells his soul. But I didn't see any of that in the first volume. Presumably, it will become clear in later volumes. I'm all for a gradual build-up of a paranormal world, but you have to give me something to work with at the beginning. And I didn't see much in this volume. 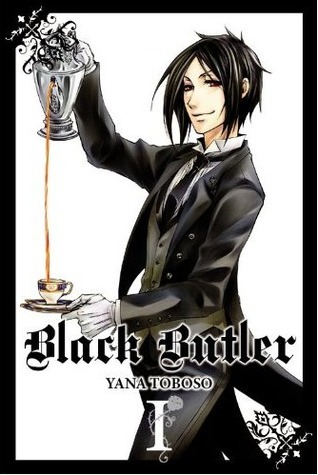 Sebastian emphasizes over and over what a good and dedicated butler he is. Obviously, he's more than that, but I couldn't tell just from reading. Ciel seems like a spoiled, weak 12 year old boy who relies on Sebastian for everything. I think this is also a poor characterization, but it's what I gathered from the volume. My main problem with this volume is that not much happened for a long time. We had an introduction to the characters, a showcase of how Sebastian can do martial arts and set a table, of how Ciel owns a huge company despite being a kid, and is richy rich. Things didn' get going until Ciel was kidnapped by the Italian mafia and Sebastian had to go rescue him. That was interesting enough, but a little silly at the same time. What do you think? Have you read this series? Should I keep going? Sounds like a long set-up. Maybe it gets better with the next volumes, though I'm not sure I could stand Ciel for very long. I've been hearing a lot about this series, but haven't picked it up yet. I think most first volumes of manga focus more on the set-up so the reader can have a feel of the characters and world. I think you should keep going. Maybe things will progress faster in the next volume? I've watched the first series and it has its high and low moments. I've only read the first of the manga's though because they're so pricey but I hope to continue it one day - hope you enjoy the rest of it. I'm sorry this one didn't grab you as much as I did. I just love the creepy feeling of the book. It does take a couple of volumes to get the background story settled and it also has its moments of silliness. I've not been current with the latest volumes. I'm very far behind with my manga reads! I have been curious about this one but it never grabbed me enough to get me to read it. I had the same problem - I just didn't get into it in the first volume, and I tend to be less stubborn about following through with manga than I am with novels. If you keep reading and it starts to pick up, let me know I should start reading it again! I love this idea - I read plenty of manga so maybe I'll start paying attention to when I read things and add them to my blog! I read the first volume and really enjoyed it and was planning to continue but then my friend got the DVDs so I just ended up watching the anime. Several of my friends LOVE this series but me not so much. I mean I find it enjoyable, it has its moments but it's not really on my favourites list. It's quite smart and funny and gets darker as the series progresses but as you say can be quite silly at times (but I find that's something to expect with most manga and animes ;)). If you want something similar but in my opinion better try Pandora Hearts. this is one that is in all the goodreads top manga lists. the library has all of them so i picked the first few up. it is bad. it never got better in my opinion and i didn't understand the point of a manga surrounding food (that is what the first arc is about something with making the perfect curry to save the world or something). you can't really form a real opinion on manga by the first volume but after 3 or 4 you know if this is worth your time or not. i don't think this is one.